EasyBuild: building software with ease. A full list of supported software packages is available here. 20180426 - EasyBuild now has (experimental) support for generating Singularity container recipes & images! 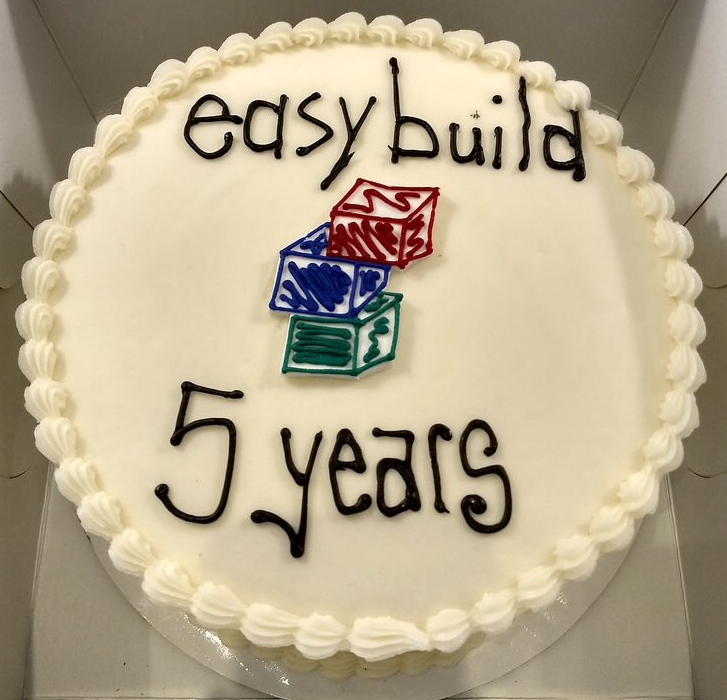 20171113 - Happy 5th birthday (stable) EasyBuild! Read the fine manual (RTFM!) at http://easybuild.readthedocs.io/. The recommended way of installing EasyBuild is via the documented bootstrap procedure. You should configure EasyBuild to behave as you prefer, subsequently. That is all that is needed to get started with installing (scientific) software with ease. Take a look at the typical workflow example in the EasyBuild documentation that shows how to make EasyBuild build and install WRF with a single command. This should install a module file for HPL which you can load to start using it. For more information on using EasyBuild, see the EasyBuild documentation. An EasyBuild mailinglist easybuild@lists.ugent.be is available to subscribe to. This list is used by both users and developers of EasyBuild, so if you have any questions or suggestions, you can post them there. Only members can post to this mailinglist. To request membership, see https://lists.ugent.be/wws/info/easybuild. An IRC channel #easybuild has been set up on the FreeNode network. Just connect your IRC client to the chat.freenode.net server, and join the #easybuild channel. There is an IRC bot present (easybuilder). Just type !help to get pointers to the available commands. The EasyBuild team also has a Twitter feed: @easy_build. EasyBuild has mostly been used and tested on x86_64-based Linux systems (RedHat-based, Debian, SuSE, ...), but can be easily extended for other platforms. Limited provisions for other Unix-based operating systems (e.g., Mac OS X) are also available. EasyBuild is developed by the High-Performance Computing team at Ghent University together with the members of the EasyBuild community, and is made available under the GNU General Public License (GPL) version 2. EasyBuild was created with support of Ghent University, the Flemish Supercomputer Centre (VSC), the Flemish Research Foundation (FWO) and the Department of Economy, Science and Innovation (EWI).